With the establishment of a truce in Korea and the return of the soldiers from overseas, the Women’s Auxiliary reverted to more local concerns. While continuing to raise funds for regimental kit, and indeed making kit such as red garter flashes and tartan backing to place on balmorals behind the cap badge, the ladies turned their attention especially to the cadets. Over the past 50 years they have continually provided support to 2136 Cadet Corps by hosting the receptions at the Annual Inspections and Ceremonial Reviews, supplying hot dogs and hot chocolate on Remembrance Day, and providing items of dress not easily available to the Corps. Of particular note in this regard was the part played by Mrs. Mabel Biss who was the liaison between the Women’s Auxiliary and 2136 Cadet Corps from the late 1940s to the 1980s. She would attend the Corps’ parades regularly and make a thorough report at the following Women’s Auxiliary meeting. It was commented that she could tell the meeting exactly how many were on parade and of what rank, which cadet’s hose were falling down, and whose kilt was not on correctly! A remarkable woman who served as long as she was able, she passed away in 1987, and was sadly missed by all who had known her. The Women’s Auxiliary also has continued to provide valuable assistance to many other aspects of the Regimental Family. It has contributed bursaries to both 2136 Cadet Corps and the Regiment to encourage post-secondary studies; held the annual Children’s Christmas parties; attended at the Museum and Kit Shop when required, and supported the activities of the Regimental Association, especially its Annual General Meetings and the annual D-Day celebrations. The ladies have also played an important role in the Regimental Heritage Foundation’s annual Ceilidhs and at the Regiment’s Anniversary Celebrations. More recently the Women’s Auxiliary has revived a task they were performing in the early 1950’s: providing ‘packages from home’ to the many Canadian Scottish Regiment soldiers servings on Canadian Forces operations around the world. All the members of The Regiment greatly appreciate the huge time and efforts these ladies put into raising funds and the spirits of all regimental members. Thank you! 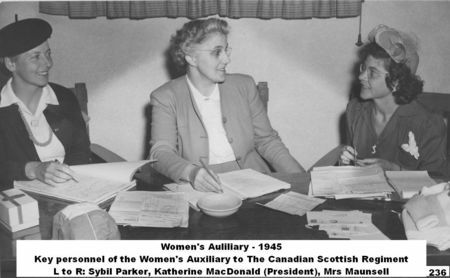 The C SCot R Women's Auxiliary (WA) is the only running WA within all the 14 Highland units in Canada; the rest all amalgamated with their Associations to form the different Regimental Family Support Committees. At present we are a vastly diminishing entity in regards to members who actually attend the meetings. And our single fundraiser every year (Dinner/Silent Auction) is held in the Spring, and we have always held it at the Trafalgar/Pro Patria Legion. All money raised goes directly to helping the serving Regiment, the 4 corps, and we have donated funds to the kit shop, the Sgt's Mess, the 100th Anniversary and hosted the 100th Picnic. We meet every 1st Wednesday of the month (excluding July, August and September) we meet in the Sgt's Mess at the BSA at 7pm. We are always looking for new members. It is free to join. So if you care about the unit, its future and its members please email Rhonda if you are interested in being a part of our caring team: fourscottys@telus.net.